QED Ruby Anniversary Evolution kabelis su QED Airloc banana tipo kištukais. Skerspjūvis 3,15 mm2. 99,999% bedeguonio vario laidininkai. Spalvomis pažymėti kištukai. Naudojama Aircore technologija. Ultra žemas talpumas. Forte banana kištukai tinka visiems 4 mm lizdams. RUBY ANNIVERSARY EVOLUTION, FORTY YEARS OF EXPERIENCE ACROSS THE SPECTRUM. Ruby Anniversary EVOLUTION is a completely new speaker cable from QED laboratories in celebration of FORTY years at the forefront of UK speaker cable design. It utilizes “Aircore Technology™” in a new miniature format to bring high end cable philosophies to the budget hi-fi market. It builds on the success of XT Evolution and Ruby Anniversary cables with which it shares a family heritage but now incorporates increased conductor spacing to further reduce losses and distortions caused by cable capacitance. This new geometry utilizes two conductors of different diameters to carry the same audio signal. This provides an alternative path for high frequency audio components which might otherwise become time smeared in a single audio pathway. Aircore Technology™ is completely effective in pushing the onset of the skin effect outside of the audio band for cables of large cross –sectional area. Because great sonic benefits are gained from Ruby Anniversary Evolution’s 3mm2 CSA it is essential that the skin effect is dealt with to avoid unwanted non –linearity in the cable’s frequency response (see Bucking the Skin Effect). Because Aircore Technology also reduces the self-inductance of the cable to around half that expected of parallel conductor geometry by calculation, spacing can be increased to reduce capacitance without the extra inductance generated by this change causing audible problems in the cable performance. The use of quality dielectrics coupled with low capacitance means that the rate of energy loss in the cable (its dissipation factor) is extremely low at 0.0001 – our lowest ever figure for a speaker cable. 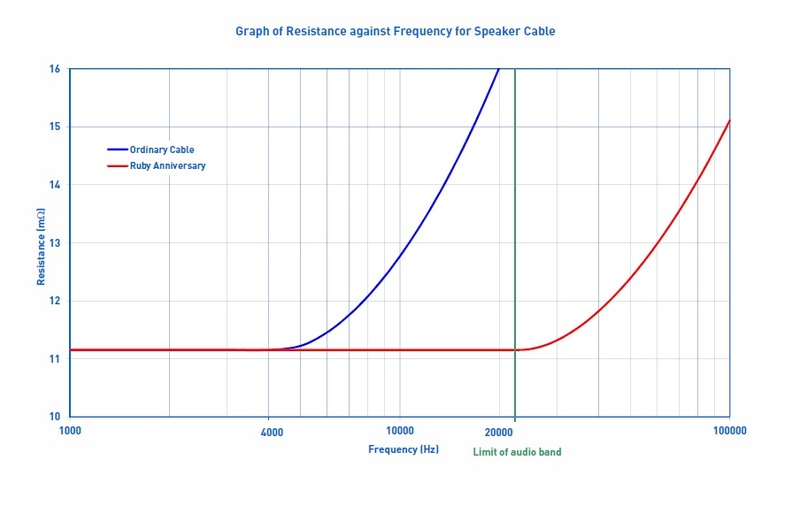 The graph shows how the resistance (non-reactive part of the impedance) of a speaker cable rises with increasing frequency. This is caused by the skin effect which forces the current to flow towards the outside of the conductors as frequency increases and this problem becomes more pronounced in cables which have a large cross sectional area. As there are great sonic benefits to be gained by increasing CSA (and lowering resistance) high end speaker cables tend to have larger conductors than cheaper ones. The skin effect problem therefore tends to affect high end cables more than thin and cheap ones. If nothing is done about this by careful changes in the cable geometry, the resistance at 20kHz can be much higher than that at dc. This is evidenced by the blue line which shows the behaviour of a typical twin conductor cable (such as cooker flex) with a comparable cross-sectional area to Ruby Anniversary. The blue cable shows an exponential increase in resistance above 4kHz so that within the audio spectrum its resistance increases by as much as 50%. Compare this to the Ruby Anniversary cable (red trace) - the Aircore™ technology has created an electrical field effect which allows the current to utilize the whole of the cross sectional area so that within the audio spectrum the resistance will not rise at all. Of course the skin effect will still come in to play even with this special cable design but the frequency at which it starts has been purposely pushed outside the audio spectrum. using inferior connectors. QED developed AIRLOC a solder-free, airtight perfect fusion between the two metals of cable and plug. This ‘cold weld’ method allows the cable and plug to offer the optimum signal transfer and therefore, better sound quality. It also reduces contact resistance and ensures perfect long-term performance.